Get the gang together for some fun activities. With a little planning and a whole lot of imagination, you can set the stage for terrific teen party activities. Don't worry too much about strict organization. Most groups prefer to improvise their way through teen party activities. The objective is to just have fun mingling with one another and horsing around. Games are fun, but let the group take the lead. Also, if you're the adult doing the planning, try to stay out of the way during the actual activity. Teens appreciate the independence. Teens, remember that there will be certain rules and a set running time for the party. Adults appreciate the responsibility. Murder mystery. A simple whodunit that you create yourself or order online. This activity can be the entire party if you start with themed invitations and require attendees to show up in costume. Tie-dye t-shirts. As long as you're prepared for clean up, this is fun activity that expands on creativity. Survivor. This requires a bit more planning, but can be great fun. Assemble the group in the early evening, blindfold them, and take them to a location like a park or woods. Use glow sticks or tiki torches to form a circle. Prearranged activities requiring group participation get things started, but just as on the TV show, members are "voted off" one by one. Scavenger hunt. Run through the town looking for certain items. Key stops can be arranged in advance to make transportation easier, or pick a centralized location where everyone can find the listed items. Tailgating. Preparing good barbecue recipes ahead of time makes this activity a no-brainer. 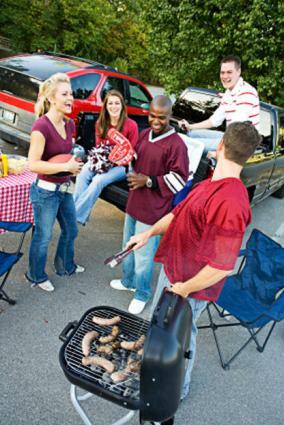 Load up the car with a few lawn chairs, an mp3 jambox, cold drinks, and grab the food, and it's an instant party. Formal dance. If the school doesn't sponsor enough fun, dressy dances, plan another that can be held in the backyard or in the basement. Whether for a special occasion or just because, here are some more action-packed entertainment pursuits. Swim party. Whether at the lake or beside the community or backyard pool, everyone loves a swim party. String a volleyball net across the pool for nonstop fun, or go to a lake that has recreational vehicles such as canoes and paddleboats. Don't be surprised, however, if everyone prefers to just chat while sunbathing. Name that tune. This activity is always a good time. Teens bring their mp3 players to the party, and let 'em rip. Attendees compete two at a time, guessing the tune after the first five seconds. The winner of that round takes on the next contestant. Amusement park. Teens of all ages love going to theme parks, but add an extra level of excitement by going at night. Arrange for a set meeting place and time, and have the gang check in by cell phone every hour, depending on the length of stay. Mall and a movie. One of the easiest teen party activities is a simple excursion to the mall combined with a movie. They can meet up with a variety of friends this way, shop, and eat. Most teens can spend a couple of hours or more in each other's company without supervision. Laser tag. This helps everyone burn off some kinetic energy. Good for all ages, but a better idea for those not driving yet. Miniature golf. Some of the teens will think this is lame at first, especially if they're older. However, if it gives them a chance to socialize without adults around, they'll enjoy it a whole lot more. Find out how long an average game lasts, drop everybody off, and pick up the group at a set time. Allow for a stop in the arcade as well. Keep up with teen life at LoveToKnow Teens.